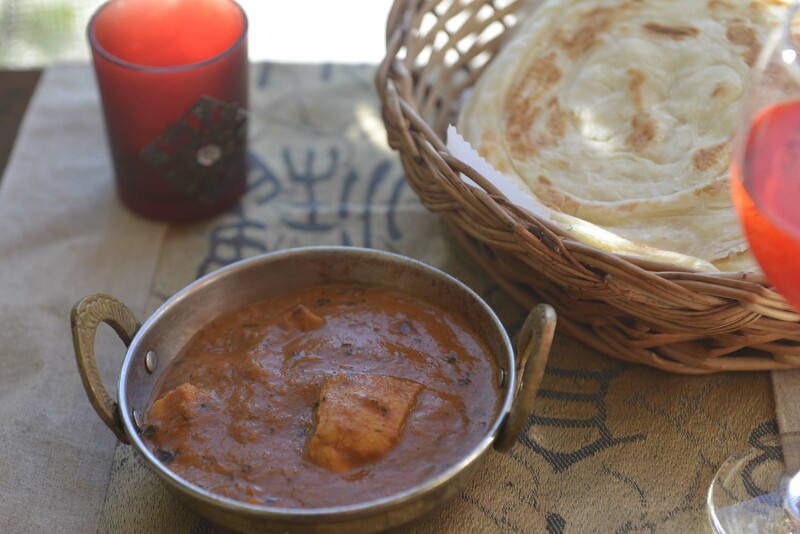 This is Ari Pathiri – the soft as feather rice flatbread. This gluten free bread goes by a few other names as well – nice pathiri , neriya pathiri and malabar pathiri , to name a few. As the last name on the list suggests it is very popular in the Malabar region of India. This delicate soft bread can easily be paired with spicy curries or sweet syrups. The best pathiri that I remember was the one that my dorm mate’s mom made. When you are in a residential school Fridays and Mondays are special. Friday’s you either look forward to going home (your’s or a friend’s ) and Mondays you wait for the friends to come back :-). On one Monday morning Sherri came back to the hostel late, but with an extra special treat- Pathiri and Mutton Roast. News like these travel fast when a bunch of teenagers are subjected to barely palatable mess food for any length of time. Suffice to say that she was very popular that day – I don’t think our gang of girls were ever as silent as during that meal ever. Sheri, this one is inspired by you ! 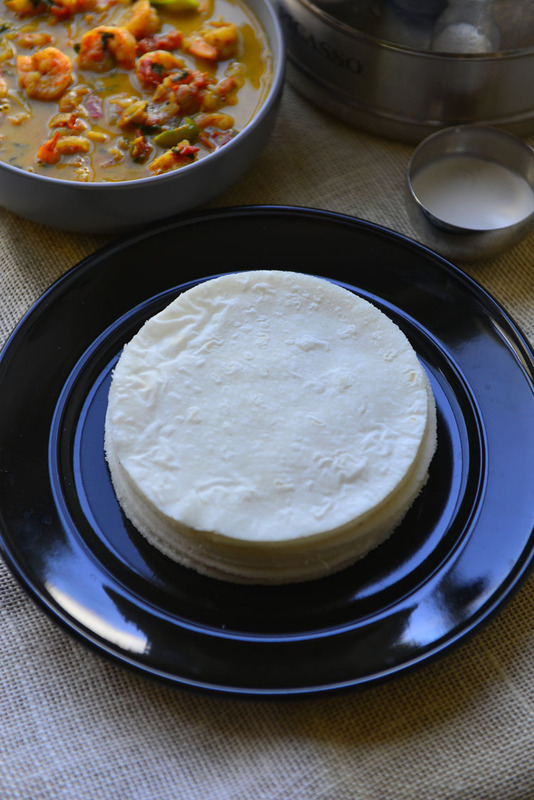 Pathiri is made of rice and is naturally gluten free. 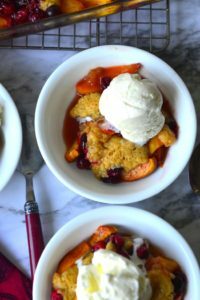 When you or someone you love can not have gluten you go to great lengths to adapt standard gluten rich recipes. 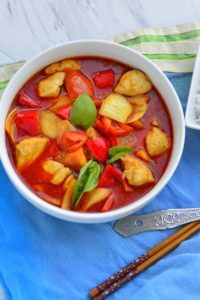 Often times we forget that there are many delightful recipes around the world that are naturally gluten free . Jowar roti, ragi roti , Bajri roti , injera, corn tortillas and the south Indian dosa are all good examples. Some of these grains used are more environmentally viable as well – for example Bajra or pearl millet takes much less water to cultivate than wheat. But all the environmental concerns seem unimportant once you taste one of these gluten free flat breads. The taste and texture of these breads will win your over. The rice pathiri for example is very soft and very pliable and goes with a sweet or spicy side. For the spice lover serve it with beef fry or chicken curry and for the ones with the sweet tooth set with thick coconut milk and a sprinkling of sugar/honey. Back to the gluten – being gluten free is not a good news when it comes to bread making. Gluten creates the essential structure of the breads, without which it will easily collapse and break apart. To provide the much needed structure part of all of the starches in the flour needs to be cooked. When cooked the flour particles swell up absorbing water and create a gelatinous mix. This provides the needed structure and moisture and is the secret to making and melt in the mouth pathiri. Heat water with a pinch of salt until it comes to a rolling boil. Add the flour, stir and turn off the heat. The hot water gets instantly absorbed into the flour. If you have led hands you can dig in and and knead this into a smooth dough, I have seen a few doing it, but personally wouldn’t recommend it. The better way is to cover the dough and wait for a little bit. When the dough has cooled a little and is warm enough to handle, knead into a soft dough. If needed add more flour or warm water as needed. The dough should be soft so that you can break off a piece roll and flatten without any cracks. Cover the dough to prevent it from drying out. Heat a griddle or tawa or any thick bottomed pan over medium hot fire. Pinch of a lemon sized piece of dough and roll it into a ball. Dust a rolling surface with rice flour, place the dough ball and turn to coat all sides. 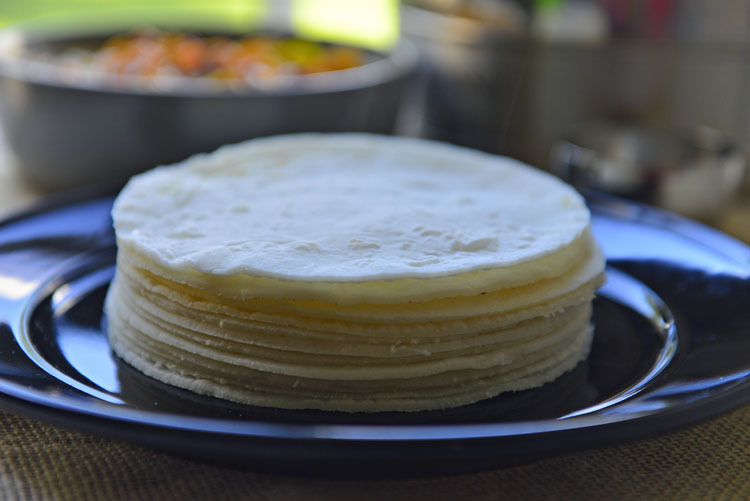 Sprinkle more flour and roll out into a thin circle – 6 to 8 inches in diameter. Sprinkle more rice flour if the dough gets sticky. 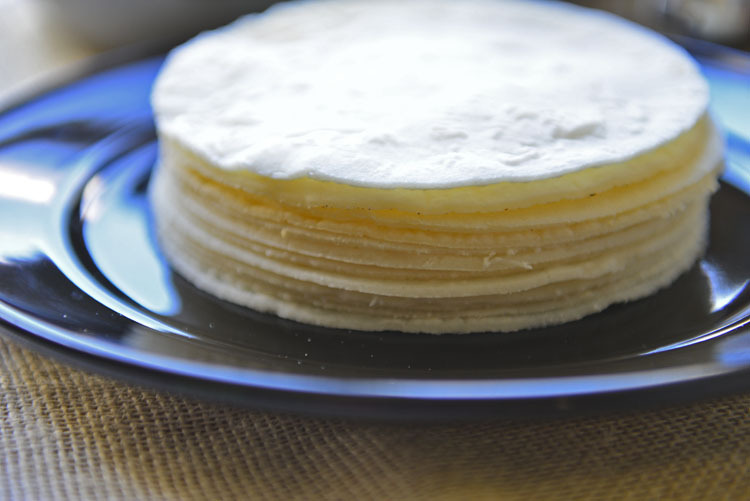 Unlike flour tortillas ( or chapathy) the edges of pathiri will be jagged. Trim using a circle cutter if preferred. Don’t worry about the pieces going to waste. Just roll the excess bits into the next dough ball. Place the pathiri on the hot pan. You can coat the pan with a thin layer of oil before cooking the pathiri. I don’t as the oil residue leaves brown traces on the pathiri and I am partial to pristine white pathiris. Let it cook for about 30 seconds, and you will notice the pathiri turning just a tad bit translucent or small bubbles beginning to form. This is your cue to flip. Cook the other side for another 30 seconds or so and flip one more time. 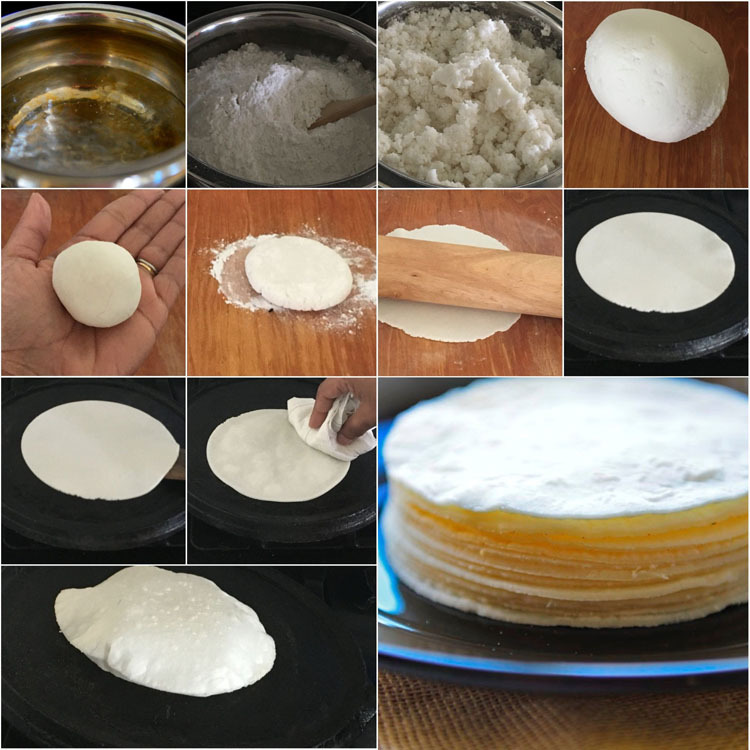 At this time usually an undisturbed pathiri will puff up as a balloon, but if does not use a clean kitchen cloth to press on the top gently to help it puff up. Remove from the pan and keep covered. You could brush a little coconut milk on top as you remove each. But that is optional. Some prefer to roll out all the pathiris before beginning to cook them. In that case coat each with a little bit of rice flour and keep covered to prevent them from drying out. After each pathiri is made wipe the pan with a kitchen towel to remove any excess rice flour. Heat water with a pinch of salt till it comes to a rolling boil. Add the rice flour and reduce the heat to low. Mix well using a wooden spoon and turn off the heat. The rice flour will clump, make sure that there are no large pockets of dry flour and all the water is absorbed. Cover with a lid and let it rest for 10 to 15 minutes until warm enough to touch. Knead well using your hands. If needed add a few teaspoons of warm water or extra flour as necessary. Form into a soft and smooth dough. Place the dough in a closed container or cover with kitchen towel. Heat a griddle or a thick bottomed flat pan (tawa) over medium heat . Pinch off a lime sized piece from the dough. Roll it into a smooth ball. Dust the work surface with rice flour and place the ball of dough. Dust the top with more rice flour. Using a rolling pin roll the dough into a thin flat disc. Transfer to the hot skillet and cook over medium high heat for 20 to 30 seconds or till the pathiri turns slightly opaque (dry). Flip land let it cook for another 30 seconds before flipping again. 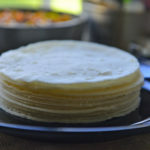 If the pathiri does not puff up on its own press down gently with a spatula or clean kitchen towel to help it bubble up. Transfer the cooked pathiri into a container. Cover with a kitchen towel and close the lid. Wipe any excess rice flour from the skillet before making the next pathiri. Repeat the process till all the dough is used up. Serve with any spicy meat dish. Use pathiri flour is when available. If your rice flour is not roasted, heat a thick bottomed pan over medium heat and add the flour. Toast it for a few minutes stirring continuously until all the flour is heated through. Turn off before the flour begins to brown. It is important to keep the dough from drying out. If there are dry bits the pathiri will not be smooth and will not puff up . Do not let the dough or the flattened pathiri dry out. Wipe the pan after making each pathiri to remove excess rice flour. Lightly coat you palm with oil to prevent the dough from sticking when kneading it . Can it be made in bulk and stored ? And if yes, what will be best way to store it. I would not recommend making these in bulk and storing, as these are very lean and tend to dry out real fast. But if you must , stack them with a piece of wax or parchment paper between each and store in a freezer safe bag after taking as much air out as possible. When ready to use take out and defrost as needed. Exposing the defrosted pathiri to a little bit of steam will make it almost as soft as the fresh ones.